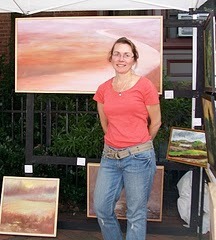 Catherine Gibbs is an established painter in Western Massachusetts and does her work at a studio in Easthampton. She paints with bold brush strokes, using vibrant colors to show emotion and movement in landscapes and urban scenes. Her inspiration comes from the nuance and drama of her everyday world. Her evocative works have been featured throughout Massachusetts, including Boston, in New York, and in the Midwest. Her work will be on display at the Cathedral through May 3.